We first discovered the gloriousness that is spaghetti squash in a CSA farm box a few years back. I cut it in half (which is no small feat), scooped out the seeds and roasted the halves face down with olive oil until they were soft (what I’d been instructed to do with any mysterious squash). But I was pleasantly surprised to find that the squash’s meat came out not in spoonfuls, but in spaghetti-like strands that, with a little garlic, salt and olive oil, can stand on their own as a side — or make a too-good-to-be-true substitute for pasta. We probably discovered eggplant the same way, using it in the go-to recipe of eggplant parmesan (which is one of the few meatless meals my husband requests by name). But only recently have I fallen for this pair together. They both take on roasting in olive oil, with a little garlic, very well, growing a rich, almost meat-like (in the case of the eggplant) flavor. You may have a spaghetti squash or eggplant lingering in your fridge from your winter vegetable share, just waiting to be ousted for the hoards of asparagus and peas on their way (can’t wait!). So here are a couple of great recipes to put them to good use. And if you, like me, are preparing to go on a spring break trip that involves a swim suit (scuba in Cozumel! 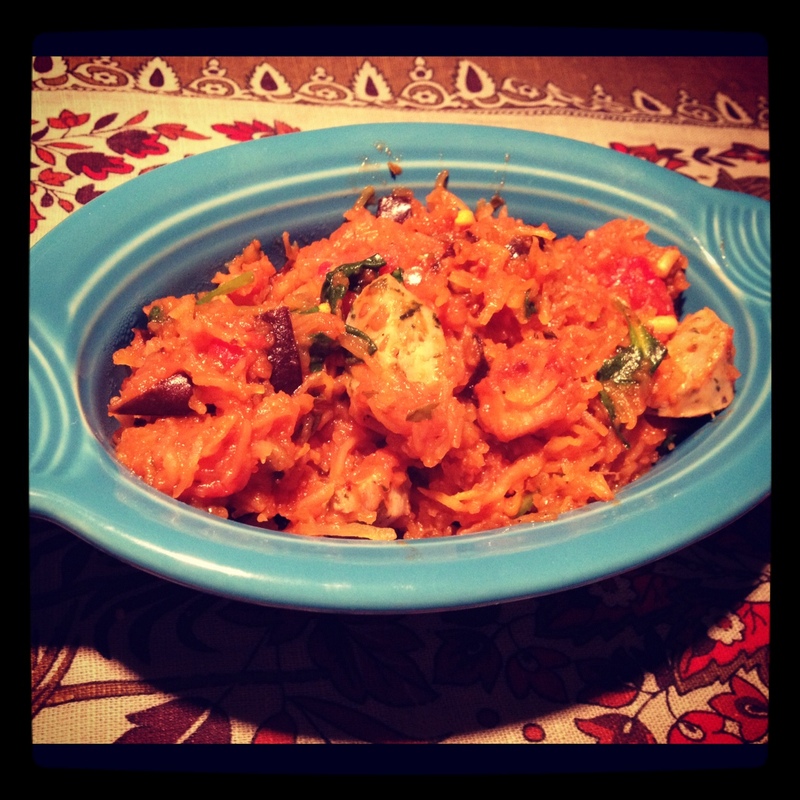 ), you may be cutting back on your pasta- and simple carb-based dishes these days, too. So when that craving for a pasta-like something hits, try this instead. It will hit the spot. Protein of choice (or go meatless) — we like an organic garlic chicken sausage, cut into pieces, for easy weeknight dinners. You can also make turkey or beef meatballs under the broiler in about 7 minutes. 1. Preheat the oven to 400 degrees while you chop the vegetables and prepare the squash. Place squash halves cut side up on baking sheet with edges and drizzle olive oil, salt, pepper and minced garlic liberally across the top, rubbing it in with your fingers. Place in the oven and cook for about 40 minutes or until tender and easily forked out. 2. Place eggplant cubes on another baking sheet and drizzle with olive oil, salt and pepper. Toss to coat. Place in the oven for the last 10-12 minutes of the squash’s cooking time, so they come out together. Toss the eggplant cubes once halfway through for even cooking. You want a bit of a char but they do burn quickly. You can also toss in the pine nuts for the last 1-2 minutes of the eggplant’s cooking time — which means everything would come out together! 3. 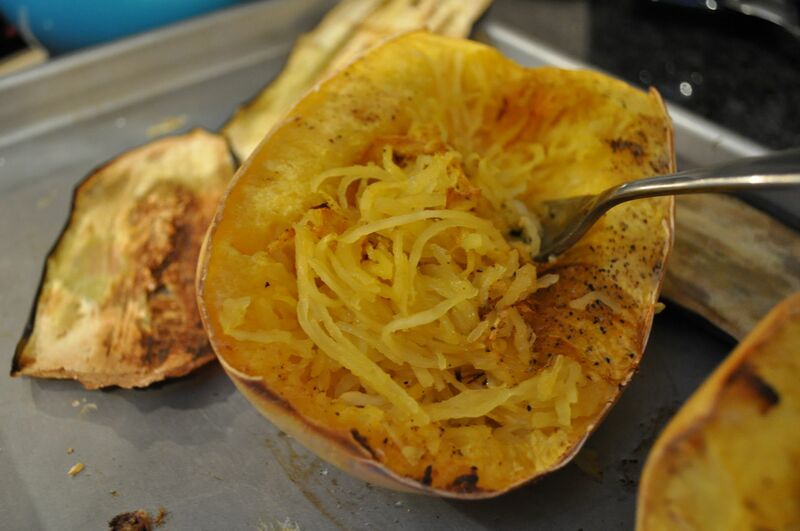 Once the roasting is done, fork out the spaghetti squash into a skillet or sauce pan over low-to-medium heat. 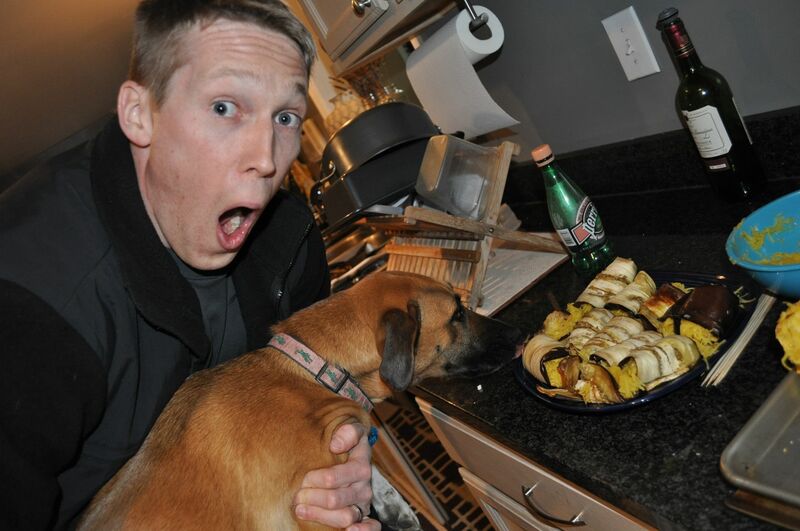 I suggest holding the squash in an oven-mitted hand and scooping out with a fork in the other. Add roasted eggplant and pine nuts, spinach leaves, pre-cooked sausage or meatballs and marinara sauce. Stir until ingredients are heated through, adding salt and pepper to taste, blending in sauce to coat. Serve hot and enjoy! One medium or large eggplant, cut lengthwise into long strips. 1. Preheat the oven to 400 degrees. As you cut the eggplant, lay the slices on a paper towel and sprinkle with salt, then top with another paper towel and another eggplant layer. Repeat. This will help absorb the extra moisture so they roast nicely. 3. Lay the eggplant strips out on several baking sheets and roast them in shifts while the squash is cooking, 15-20 minutes for each sheet, or until the edges are nicely browned. No need to flip the slices. 4. Once the roasting is finished, (I also roasted a pork loin to go with this side dish, filling up my oven.) you can assemble the egg(plant) rolls. Leave the eggplant strips on the baking sheet and spoon a small dollop of the cheese near one end, followed by a mount of spaghetti squash. Roll the eggplant around the stuffing, tucking the loose end underneath on a plate (you can use toothpicks, but I didn’t find them necessary). You’ll get the hang of how much stuffing to put on each one. Keep rolling and repeating until you’ve run out of eggplant. 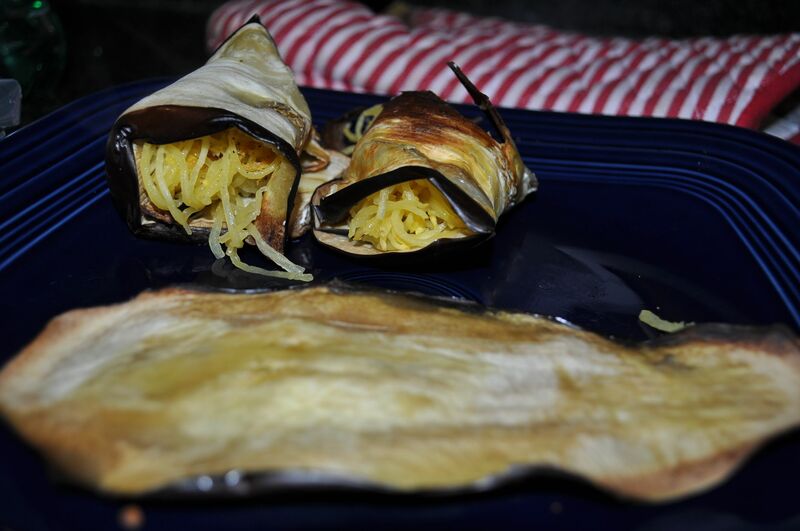 If you have leftover spaghetti squash, pile it underneath the rolls to hold them in place on a plate. Serve alongside pork loin or another simple roasted meat. If for a party, you could roll these ahead of time and warm them in the oven. I’ve been wanting to share both of these for a while. Let me know if you have any questions about the recipes in the comments below. I like to just make things up as I go along, substituting the ingredients I have. Feel free to do the same!